Toddlers are typically selfish. With their toys. With their books. With their stuffed animals. With their parents' attention. Sharing doesn't come naturally, which is why you end up hearing, "Billy share that toy with ___" over and over again at any kid-centric place. Teagan and Quinn are no different. Fights over toys are a constant in our house. 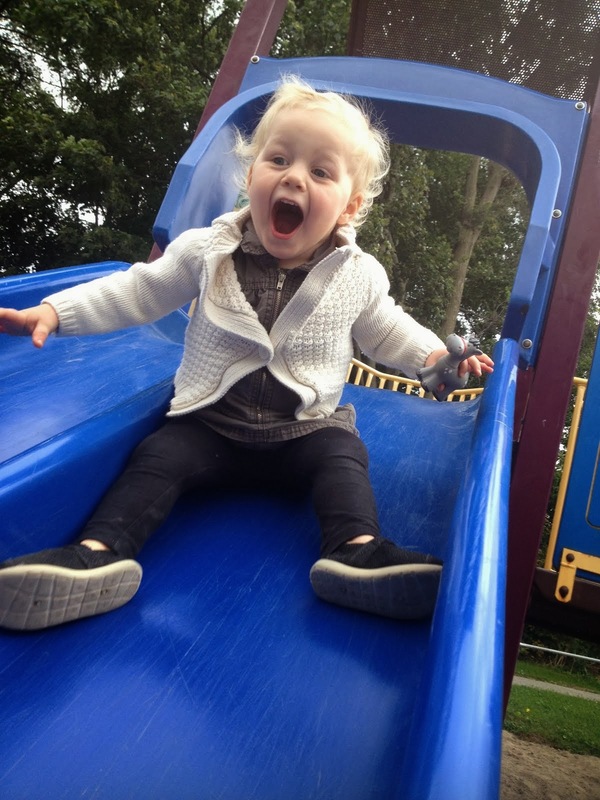 Teagan went through a phase of claiming EVERYTHING as her own, including the slide at the park or the trampoline at the indoor play centre. If other children dared play with "her" things, they had to deal with the wrath of Teagan. What's interesting though is that when it comes to food, they are incredibly thoughtful little people. No matter how delicious their food may be, they will always offer some to others. Quinn didn't hesitate to offer my Mom a lick of her ice cream the other night. Teagan immediately offered me a sweet potato fry tonight. Ice cream and sweet potato fries are huge hits in our house and are considered treats so they aren't eaten often. For two weeks around Christmas time, Quinn asked me to get her a gingerbread cookie. She had never had one, but she knew that she wanted one. So, on one snowy afternoon after they woke from their nap, I bundled them up, loaded them into the stroller and headed out on a gingerbread cookie hunt. It was after Christmas, so I hoped that I could find some. Luckily, the French bakery down the street had them. As soon as we left the cafe, I gave them both a cookie. "Mommy has a bite?" Quinn asked me, seconds after the coveted cookie was in her hand. While I've always tried to encourage and teach sharing at home with toys, I've never done it with food. But, from the time they were able to eat solids, I've unintentionally modelled this behaviour. I have always often offered them bites of what I'm eating. Jenn and I will share with each other as well. Sure, it's sweet when they offer me a bite of their soup or their apple. But, what really gets me, is when they don't hesitate to offer me a bite of their delicious, rarely offered treats. You can see in their eyes how much they love it, as they quickly wolf it down. They know that the supply is finite, but their two-year old hearts and minds still take a moment to think about others. That is some yummy looking ice cream those sweet girls are chomping on! I am not sure I would share. If this is a trait learned by parents, Grace is out of luck. My wife is the worst at sharing food, lol.